Mrs Daniel gladly entered into the work of God resigning her position, as one who taught school to teacher-trainees. She and her husband, the late Bro. Daniel, saw great revival visitations in many places. Now some sixty and odd years after the first waves of revival which brought transformed living to many, these visitations still continue in some areas. 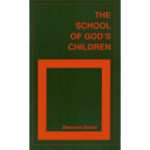 Mrs Daniel’s earlier booklets, “The School of God’s Children” and “A Wise Woman Buildeth Her Home” have been a blessing to many thousands in several nations. We believe that this present book consisting of 17 of her messages will be a blessing to many.